Manufacturer & Exporter of Thread Work Embroideries. Our product range also comprises of Lehenga & Gown Embroidery Work, Embroidered T-Shirt and Swarovski Embroidery. Handmade Thread Embroidery Work to our client. These include high quality of fabrics and Resham Threads. That are adorned and embellished with fragile and attractive embroidery and goods quality and reshams color. Our customers highly value these for their and captivating looks. 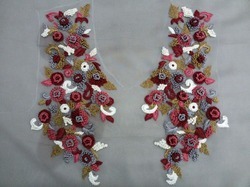 The embroidery is done by our team of skilled craftsmen as per latest fashion styles and trends for our Client.